Went to my sisters' house , as they were having a party for my nephew who just graduated from high school. The twins were supposed to fly out to New York today with their mom, but there's been a snafu with the moving arrangements, so they aren't going until NEXT week, which means we had the girls for the past 2 days & took them with us to the party. I tried both days to get a picture of the 2 of them side by side where their faces showed, but #1--they don't like to pose, #2--they don't like to stand still , #3--they don't like to stand NEXT to each other & pose & stand still, & #4--they don't like to look at the camera, so this was as good as it got! 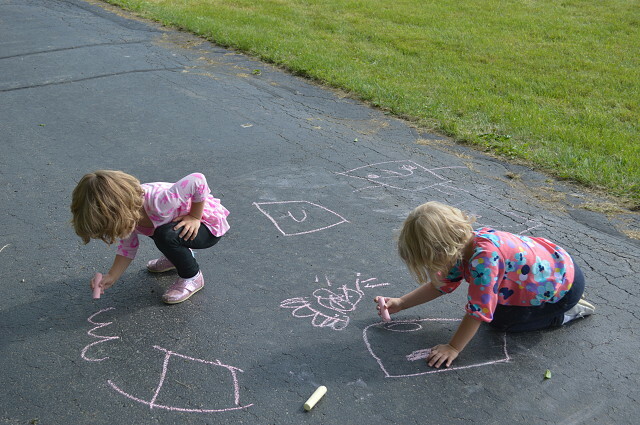 My sister gave them sidewalk chalk, which kept them busy for quite a long time!